Anyone planning on leaving St. Charles Parish needs to do so today before the onset of tropical storm force winds begins early tomorrow morning, according to the parish’s emergency operations director. EOC Director Tab Troxler says that Gustav is the most serious storm threat he has faced in the 18 years that he has been on the job. He says that tropical storm force winds should reach the coast early Monday morning, with a possible rise in tide levels as early as tomorrow evening. The current track presents storm surge implications for the entire parish. Because of Gustav’s likely angle of approach, storm surges will be pushed up into the Barataria Basin and into the unprotected West Bank of St. Charles Parish. Storm surge is of particular concern within the Sunset Drainage District in Des Allemands. 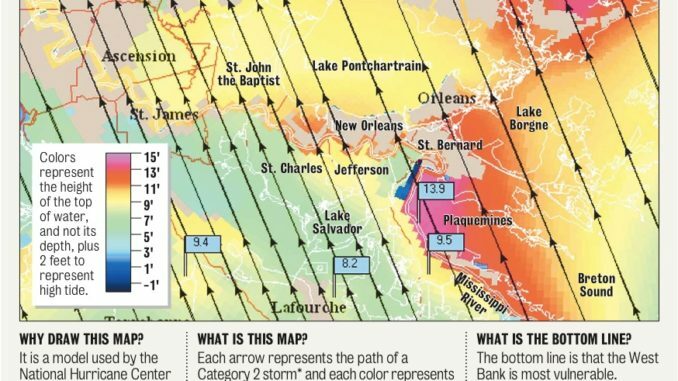 East Bank hurricane protection levees could possibly be overtopped due to wind-driven storm surge in Lake Pontchartrain. Storm surge modeling shows possible surges of 9 feet in Bayou Gauche and 12 feet in Luling’s Willowdale subdivision. Storm surges are projected at 12 to 13 feet on the East Bank, testing the muster of the hurricane protection levee there. Any residents that plan on remaining in the parish need to contact either the Emergency Operations Center or the Sheriff’s Office. That way, parish emergency officials can locate residents in case they need to be rescued. The Sheriff’s Office will also go door-to-door this afternoon and tonight to get a better idea of how many residents have chosen to remain in the parish. The Sheriff’s Office can be reached at 985-783-6807, while the number for the Emergency Operations Center is 985-783-5050. Still though, officials are urging residents to leave the parish, as there will be no guarantee of emergency services in Hurricane Gustav’s aftermath. Subsequently, the St. Charles Parish Sheriff’s office will implement a curfew nightly from 8 p.m. to 6 a.m. Anyone found on the streets who are neither emergency workers nor persons attempting to evacuate are subject to being detained and/or arrested. This curfew will be in effect until further notice. The parish will end assisted evacuation at 2 p.m. Anyone still needing evacuation assistance needs to call EOC as soon as possible.